Patrick Gillespie holds a Bachelor of Science and a Master of Arts in Leadership (Ministry) from Trinity Western University. 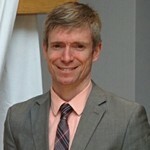 Currently, he is an Educational Consultant with the Catholic Independent Schools Vancouver Archdiocese (CISVA). Patrick brings a variety of experience; since 1998 he has served the Archdiocese in various capacities, as Director of the Catechetics, Director of Evangelization, a Consultant for the Office of Youth Ministry, and has worked in the Catholic High Schools. He is passionate about the work of passing on the faith of the Church and convinced that in catechesis we can encounter Jesus Christ, the answer to all humanity’s longing. Patrick, his wife Shauna, and their 5 children are parishioners of Star of the Sea parish.